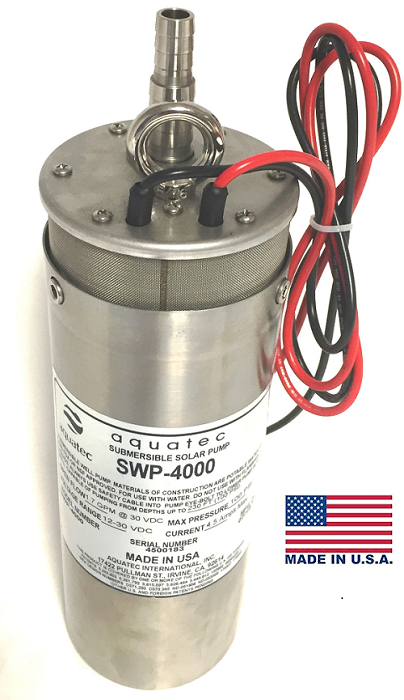 The Aquatec SWP-4000 Submersible Solar Water Pump is one of the highest quality diaphragm pumps we know of and we are already getting positive feedback from our customers. These DC water pumps are made in the USA with proven reliablity, design and performance. Aquatec pumps have a strong high-grade stainless steel case (as opposed to the Shurflo‘s plastic enclosure) that allows the pump to go down as deep as 100 feet and gives it the capability to pump water up to 230 feet @ 100psi. The pump can work off of 12 volts (or 24 volts when used with the Aquatec APC-30-250 controller). However, more water volume is achieved by using the pump with 24 volts, as indicated by the chart below. The Aquatec well pump has a brushed permanent magnet motor has an estimated operating time of 4000 hours and the three-chambered pump gives unparalled performance. This DC water pump is designed for long time use but if service is ever required, the pump is easily field serviced. After two to four years of operation it may be necessary to replace diaphragm, valves and motor brushes. Ask us about the full line of available repair kits. Submersible pumps typically take a high surge current to start because they have such a small diameter. With the Aquatec pumps this doesn’t happen as it takes very little power to start the motor to move the diaphragm. 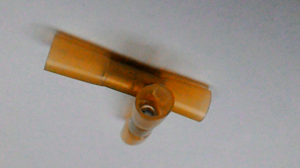 This eliminates the torque reaction you would have with a regular pump. Two 36 inch 12 awg input wires are preinstalled with double O rings to eliminate the chance of water intrusion at the wire input. This has always been a problem with Shurflo pumps. Four-inch well casings are required for the Aquatec SWP-4000 pump. The Aquatec SWP-6000 can pump double the amount of water but it does require a well casing of 6 inches or more. A 50 mesh stainless steel screen protects the pump from foreign dirt intrusion. If the well has a sandy bottom, a well pump sock can be used (available from most pump distributors). This solar pump has a dual port outlet for ½ inch (15mm) hose tubing (0.50 inch ID) or ½ inch Poly pipe. As an option (.62 inch ID, which is equivalent to 5/8 inch (18mm) hose barb tubing can also be used. Pumping up to 230 feet requires 2.3 feet for 1 psi so the pump can produce 100 psi and high pressure pipe should be used accordingly. We include waterproof crimp connectors with your pump order for easy connection to your 10 awg submersible cable. Up to 48 volts can be put into the Aquatec APC pump controller and this would regulate the voltage down to 30 volts. This insures that more pumping can be achieved even on a cloudy day when a solar panel would be producing fewer watts. The controller also has linear current boosting: in the event that a panel gets cold, and produces an abnormally high voltage, the controller will lower some of the high voltage to boost the current. This increases the pump’s efficiency to produce more water. 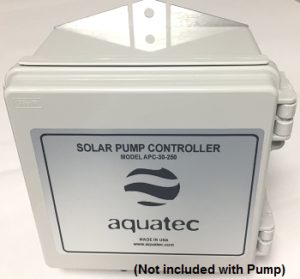 The Aquatec APC-30-250 controller has all the features of (and can replace) the Shurflo 902-200 and the Shurflo 902-100 controllers, and has the added capability of an extended operating range, since many systems are no longer 12V.